Jeremy Corbyn has said he is "not going anywhere" and plans to lead Labour into the 2020 general election. 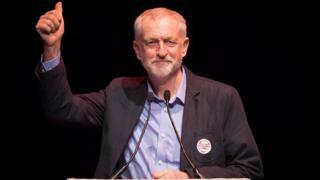 Mr Corbyn told the Sunday Times his critics should not "obsess" about him and urged MPs to recognise the support that swept him to the leadership. But shadow minister Angela Eagle refused to say he was the best person to lead Labour up to the 2020 vote. Mr Corbyn also said he was "appalled" at MPs who applauded Hilary Benn's speech backing air strikes in Syria. He said Parliament was no place for "jingoistic cheering". Mr Corbyn was elected Labour leader in September with almost 60% of 400,000 votes cast. He will celebrate 100 days as leader on Monday. But he has faced questions over his leadership and criticism from sections of the parliamentary party. He did, however, receive a boost when Labour won the Oldham West and Royton by-election earlier this month with a higher vote share than at the general election. Asked if he expected to lead the party in the 2020 general election campaign, Mr Corbyn said: "Absolutely. I'm not going anywhere." "They should recognise that I was elected with a very large mandate from a very wide variety of people from all parts of the movement," he told the newspaper. "There is no imposition of any mob. What there is is a development of participatory democracy. The parliamentary party is a part of the party, a very important part, but it is not the totality of the Labour party." Media captionAngela Eagle MP: "It's my job to work with the leader that we've got"
Of his critics, Mr Corbyn added: "I would encourage them to share their talents with all of us, not keep it to themselves. Some people are more difficult to reach than others. They shouldn't obsess about me." But speaking to the BBC's Andrew Marr Show, shadow business secretary Ms Eagle refused to say Mr Corbyn should definitely still be in place in 2020. Asked directly if she would like to see him remain leader for the rest of the Parliament, Ms Eagle said: "We have our leader." She added: "It is my job to work with the leader that we've got to try to get the party positioned so that we can have a go at being the opposition to the Tories and demonstrate some of the mistakes that they are making but also get ourselves sorted so that we can put a compelling case to the British people in 2020 to give us a chance at government again." Ms Eagle, who stood in for Mr Corbyn two weeks ago at prime minister's questions, also contested the Labour leader's criticism of the reaction to Hilary Benn's speech on Syria. She said: "I think it was genuine admiration for the case that had been made."